Are you considering a VHD and wondering what the Wessls are like? 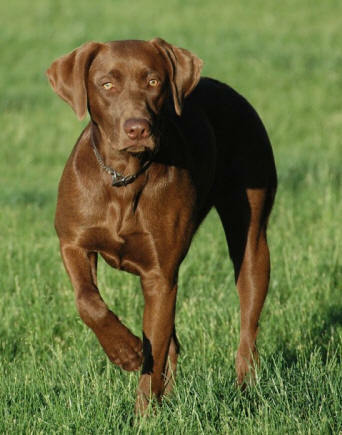 They are active; think pointer energy with the retrieving desire of the lab! Not unlike any other hunting dog, but she is intense. When she figured out the retrieving dummies were on the mantle or in the garage, she wouldn't and still won't stop trying to get to them. Before we picked Brie up at 52 days I wondered what level of prey drive and "birdiness" she would have. Those thoughts and concerns are gone. At 8 weeks she would scent a bird wing on the lawn from 20 or 30 feet downwind and race to it. 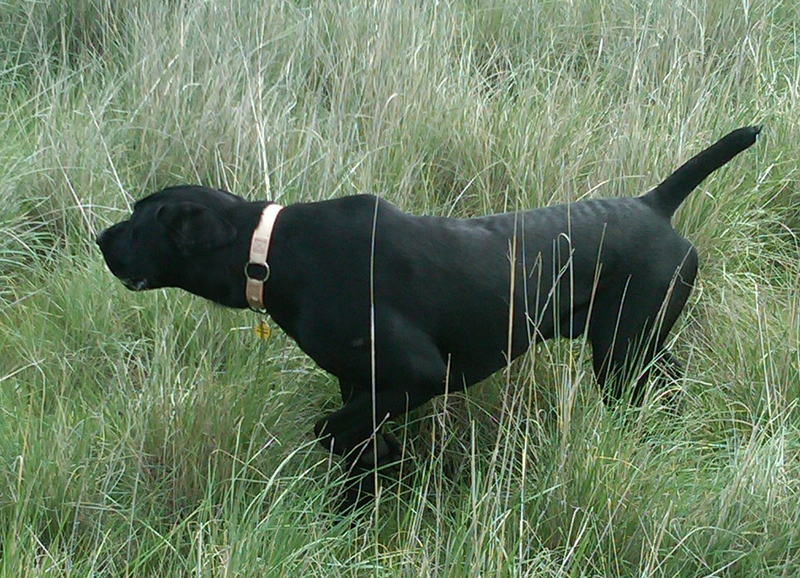 At 4 months old she was fairly uncontrollable when searching out quail, ducks and pheasants on our daily field trips. At 7 months, her attitude in the field changed and she showed a much better level of cooperation. She ranges from 30 to 300 yards out depending on cover and my attention to her, but she always checks back and works with me. Don't get me wrong, when she is distracted she doesn't hear well but when she realizes I want her back she is headed my way at a run. At home she isn't needy, she doesn't want to be on your lap or in your face and if she isn't sleeping, chewing on a bone or bringing you a toy, she is headed to the back yard to hunt .....anything. On the other hand she sleeps all night on the dog bed (one side r corner of our king bed) with no problem. Here's some recent video of Chica doing water retrieves. I haven't worked with her a whole lot this summer, but I think she's doing really great. I'm already looking forward to both duck hunting and pheasant hunting his fall. She's not only a wonderful house pet, she's going to be a great hunting companion, Chris is attached to her as much or I am and we wouldn't sell her for a million dollars. Here are the pictures that I took on her first hunting trip. After I shot the first bird, I showed it to her and let her smell it. 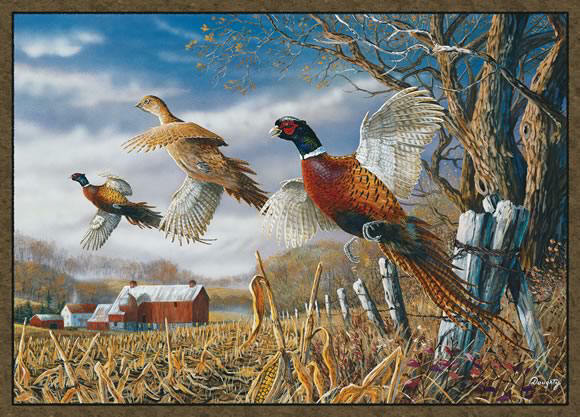 After that she was on the pheasants like she had been doing it for years. I shot 9 more birds on the trip. She retrieved 5 of them that I had killed and brought them right back to me. I wounded 4 others that she ran down, located them in the brush and brought those right back to me. On the last day of hunting, she pointed to a spot that my hunting partner walked in on. No bird flushed but Coco would not give up her point. My partner started lifting up brush and branches off the ground. Coco dove in and came up with a mouth full of feathers. The rooster took off running and Coco was after it. After what I estimate 100 yards, Coco dove into the wind break and came up with the bird. She brought it right back to me. It had a broken wing. So she got that one by herself. I would recommend your dogs to anyone. She is also a great house dog and companion. I have 6 and 10 year old grandchildren and she loves playing with them. I've been very happy with Jake. Thanks for breeding such a great dog. A little back ground, I had always had Retrievers. Labs, Chesapeakes, and a Golden Retriever. I had never trained a pointer before. Well these Wessls are pretty intelligent dogs and very easy to train. 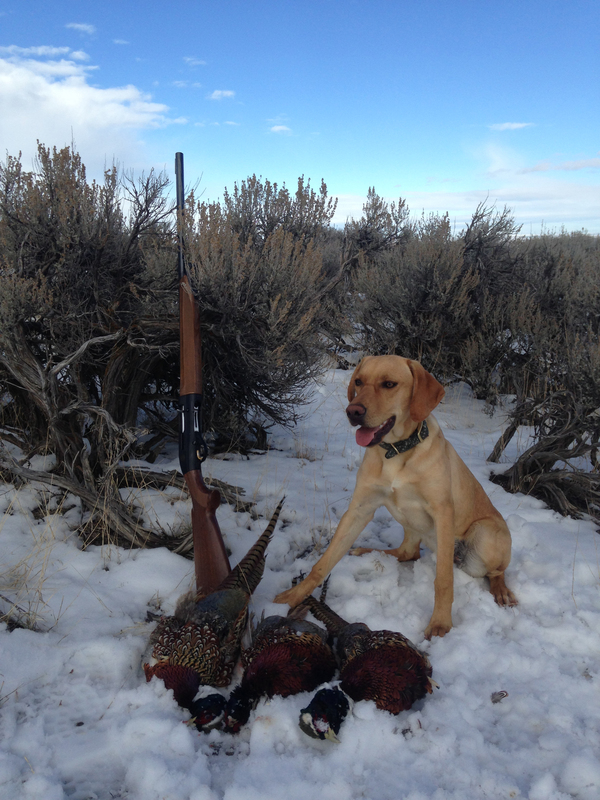 Jake is now 3 years old and has 3 yrs of hunting Chukars, Huns and Quail under his belt. He is rock solid on his points. Has a great nose. Covers a lot of ground and he can run all day. I haven't had a day where I've been able to wear him out. He hunts well with my buddy's dog, honors points but hunts for me and doesn't worry about what the other dog is up to. Loves kids and people. I've never taken him Duck hunting but I can't keep him out of the water. He's a great swimmer. Just had him out today swimming in Lake Lowell and the Ice has just come of the lake. My wife told me that he wouldn't be allowed in the house but she's the first one to let him in. She even lets him sleep on the old couch sometimes. He's well behaved in the house. I've attached a few pictures so you can see what he looks like and see how he is doing. The smaller of the two dogs in the first picture is my Daughters dog. Sophie. As you know Jake is her sire. She is just 9 months in this Picture. Thanks for a great dog. "Hi William, Leah is almost 3 years old! Time has flown by. Just an update and another thank you to such an amazing pup. any training... all pure instinct! We are in awe of her brilliance. We could not as for a better addition to our family. Thank you so much again for such an amazing breed. We are hoping to add another in a few years! " We recently purchased one of your puppies and absolutely love her! We were curious if you have or will have any puppies available around the first of the year. I appreciate your time And have a great weekend! "Just bought the male pup from Cabelas parking lot, this last Sunday. Would love to have his birth date. Impressed with this pup. Would like to be put on the list for a female, maybe 3 years down the road. I have never had a pup this well behaved. Sleeps through the night from the get go. Calm, wiling to please. Awesome personality. Instead of researching, we bought on site.ates. not interested in breeding now, just hunting dog, that is a pleasure. 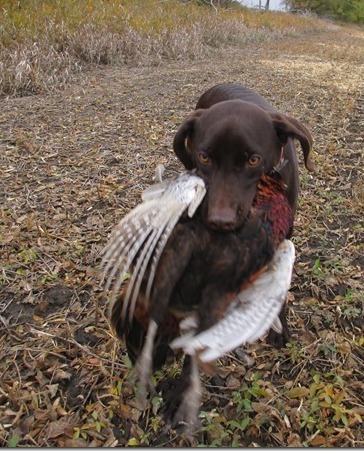 Wessels has trained all breeds of pointers and retrievers professionally for over 30 years. THE Kennels has training grounds with Boise river frontage, as well as duck ponds, river brush and farm ground to train on. Dog boarding available and offers a discount for long term boarding. Specializing in the introduction of dogs to e-collar training and conditioned retrieving. Modern indoor kennels with skylights and floor heat. 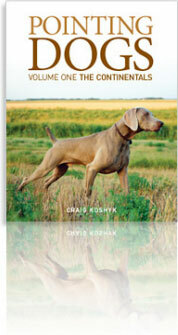 Experience that creates the finished ultimate gun dog.